Do your windshield wipers squeak even when it's pouring out? Are your wipers on full blast and you still can't even see the road? You probably need to replace your windshield wiper blades. 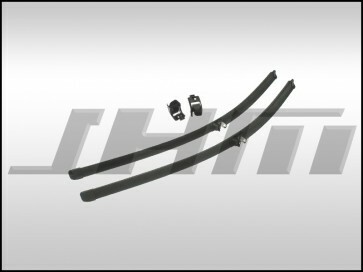 This is a high quality pair of replacement "Aero" wiper blades made by Bosch. These will fit on your wiper arms just like your wiper blades from the factory did. These wiper arms fit all B6-B7 S4s and RS4s with VINs from 8E-4-138001 and up. These will also fit your B6-B7 A4 if you put S4 or RS4 wiper arms on it. If you have a B6-S4 with a VIN less than or up to 8E-4-138000, you will have different wiper arms and blades. Go back one section to select these arms for your car.